I came to know the paintings of Carlo Crivelli since living in Le Marche. Although born in Venice, he lived, and painted, a large part of his life in le Marche. We have seen his fabulous tryptychs in the Church of San Martin in Monte San Martino and his polyptych of Saint Emidio in the cathedral Ascoli Piceno. His "Annunciation" is in the National Gallery in London. But he is not generally very well known, or so we thought. 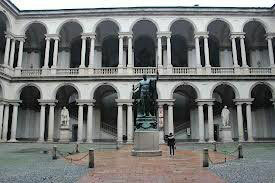 Recently, I was talking to our friend Enrica who had been to the Brera Gallery in Milan. She too had assumed Crivelli was unknown outside Le Marche. So she was very surprised to find an entire viewing room exhibiting some of his works. 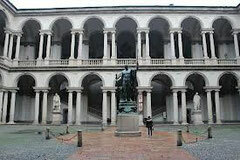 If you happen to be in Milan, they are well worth a visit.